Hibiscus plants produce large, five pedal flowers that attract butterflies and bees. Hibiscus is also used in teas and traditional Indian medicine. Cutting is approximately 6 inches and arrives with planting instructions. Sun exposure: Yellow hibiscus need full sun exposure about 6 hours/day. Height: Yellow hibiscus grow up to 10m in the wild. Soil: Yellow hibiscus' soil must be good, organic soil. Leaves: Yellow hibiscus’ leaves are ovate and are arranged in spiral. In length, they are about 10cm and in color they are evergreen. Blooming time: Yellow hibiscus bloom in late June or early August until the first frost. 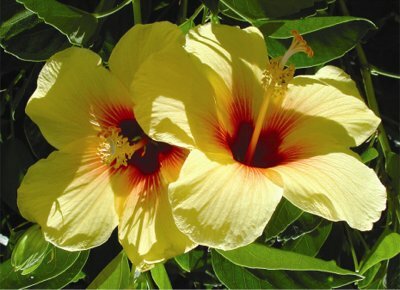 Maintenance: Yellow hibiscus need to be fertilized quite often. Furthermore, water your yellow hibiscus, but not too often as they do not like standing in water too much. If they do, you might risk getting their roots rotten.